Cherelle Khassal marked her 50th appearance for Chichester with a 17-minute hat-trick as the team beat C&K Basildon 4-2 to cement top spot in the league. It didn’t start well with a poor first half that saw Hollie Turner give Basildon the advantage. Changes at the interval saw Khassal introduced and link up with Jess Lewry - and she netted three times, in addition to the own goal, to seal the win for Chi.Courtney Clark got a late second for Basildon. There were four changes to the team who beat Gillingham, with Molly Clark and Rebecca Barron out of the country for the Beach Soccer Stars Gala. Nadine Bazan, Lauren Clark, Laura Ingram and Lewry, making her 50th appearance, started while manager Aaron Smith gave himself a strong bench to look to for any changes. The hosts nearly went a goal down in the fourth minute were it not for the heroics of Bazan to smash the ball off the line. Gemma Simmonds delivered a great ball into the box that found Lewry, who took a shot on the turn but couldn’t convert. Basildon took the lead when Turner controlled a long ball and beat the defence, causing Lauren Dolbear to race out of her goal to make a challenge. The goalkeeper got nowhere near it as Turner tucked the ball past her and into the goal. Chi didn’t look at their best with passes falling short of their target and shots on goal few and far between. Rebecca Bell dragged a shot wide in a one-on-one opportunity before Wride put the ball over from a rebounded effort inside the Basildon area. Chelsea Hinz, the Basildon keeper, blocked Helen Ogle’s effort from Simmonds’ through ball before Lewry headed wide. Half-time came and some wise words were needed for Chi as Smith decided to make two changes. Sharna Capel-Watson and Bell made way for the experience of Lauren Cheshire and Khassal. The Irish international was making her 50th appearance alongside her team-mate Lewry and that combination would prove to be the key for City. Two minutes into the second-half, Khassal struck. Lewry played the ball back for the striker in the area to send a shot into the top corner. Four minutes later Ogle thought she’d put Chi in front heading in Simmonds’ free-kick at the back post, but was denied by the offside flag. Chi did find themselves ahead, though, in the 53rd minute. Clark fired a great ball into the Basildon half and Lewry teed up Khassal, who calmly tucked the ball under Hinz to give Chi the lead. The goals kept coming, with Alex Bailess putting the ball into her own net off Wride’s dangerous corner. Then just past the hour mark Khassal ended a crazy 17 minutes by netting her third and claiming her hat-trick. A stunning, looping shot from 25 yards beat the keeper and put the game out of sight for Basildon, Lewry with another her third assist of the afternoon. Khassal and Lewry were proving lethal as they continued to attack Basildon, the Irish international missing twice while Lewry was caught offside a couple of times. While most of the possession went to Chi in the second half Basildon found the space for a shot with 15 minutes remaining when Clark forced Dolbear into a fingertip save. Clark found a late second for Basildon, heading in from a corner. That was right at the end of normal time and despite more than five minutes of stoppage time, it remained 4-2. Up next it is the last scheduled league game of 2018 before Chi head into cup match action in December. 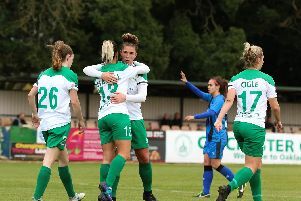 The Green Army will travel to Kings Langley FC on Sunday to face former WSL2 side Watford. City have been drawn away to Crawley Wasps in the second round of the SSE Women’s FA Cup, the tie to be played on Sunday, December 2. Chi City: Dolbear, Bazan, Taylor, Capel-Watson (Cheshire 46’), Ingram, Wride, Ogle, L Clark, Simmonds, Lewry (Stephens 71’), Bell (Khassal 46’). Unused subs: Tammy Waine, Gemma White.